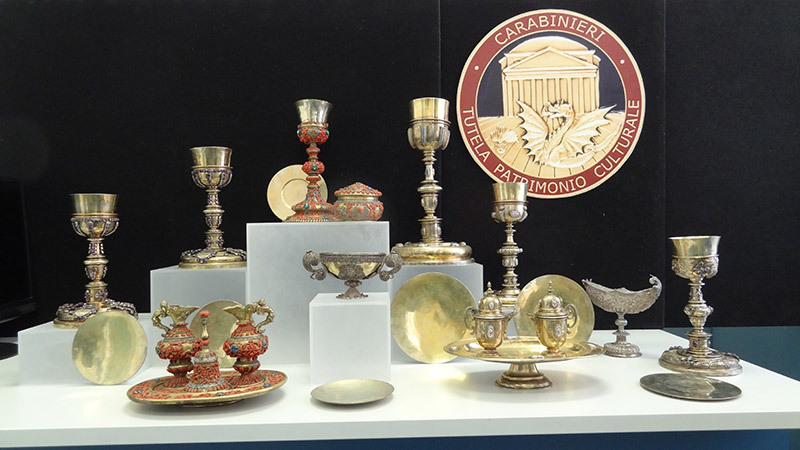 Almost the entire portion of the stolen Treasure of Loreto has been brought back to Chiusa following 28 years of tireless efforts by the Italian security forces. The recently seized pieces include richly carved cup sets, measuring jugs and pyxes, some of which originate from the personal property of King Charles II of Spain (1665 – 1700) and were endowed to the Capuchin monastery of Chiusa around 1700/1701. After “LA MEMORIA RITROVATA. Tesori recuperati dall’Arma dei Carabinieri”, an exhibit at the Quirinal Palace in March 2013 displaying artworks seized by the Carabinieri, the 23 extraordinary pieces of the Treasure of Loreto, which had been stolen alongside others in 1986, have now returned home. The pieces had been seized by the special unit of the Carabinieri Tutela Patrimonio Culturale in the late autumn of 2013 before undergoing extensive restoration measures. At the event »A treasure returns home. Special Exhibition on the pieces of the Treasure of Loreto seized in 2013« the collection was presented to the public at the gallery of the Museum of Chiusa. The treasure of Loreto is now nearly complete and ready to be admired in all its splendour. The once-missing precious sacral objects have been integrated into the existing collection and are now on display at the Capuchin monastery, exactly where they had arrived more than 300 years ago from distant Spain. It was in 1699 that Queen Maria Anna of Spain initiated the foundation and construction of the monastery and endowed the Treasure of Loreto in response to a request by her confessor Father Gabriel Pontifeser (born in Chiusa in 1653). This extraordinary collection was originally housed at the Loreto chapel, hence its name. It comprises primarily ecclesiastical paraments, religious objects and artwork by Spanish, Italian and Dutch artists and craftsmen (16th – 17th century), with the field altar of the Spanish royal couple particularly worth mentioning.